UNE BRASSERIE OUI! - La France regorge de trésors gastronomiques et chaque région se targue de possédez sa ou ses spécialités. Les brasseries représentent bien cet esprit et portent fièrement l’étendard gourmand français. MAIS EN PROVENCE - Le Léopold est la brasserie provençale de l’Hôtel Saint-Christophe, située à Aix-en-Provence ce qui, dit comme ça, augure d’ores et déjà une cuisine ensoleillée, joyeuse et raffinée. Le Chef s’inspire du terroir et propose un large choix de plats à base de poisson et aussi de viande. 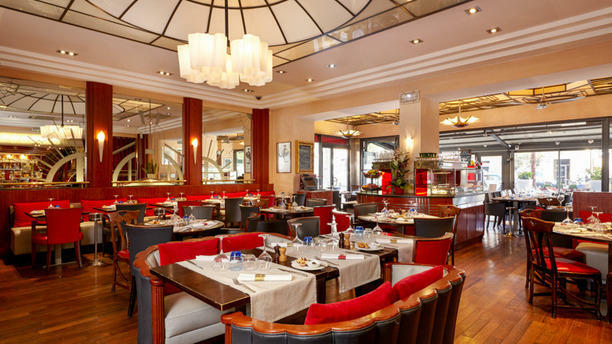 AMBIANCE 1920 - Vous prendrez place dans un cadre typique brasserie avec une touche art-déco, une grande salle bien agencée et lumineuse grâce à ses grandes verrières, un service élégant, efficace et discret. En terrasse ou à l’abri du mistral, vous vous laisserez séduire par cette adresse digne des grandes tables parisiennes. The food was good, though it was a pity that the plat du jour was already finished even though we arrived at 7:30 pm. Otherwise, the meal went very well. All I wanted was a classic steake frites. The steak was fatty and the frites were the mushy kind with potato skins on. I hate that! However, the service was most friendly and attentive, but I would not go back. Food was disappointing for the price. Also, the service was not superb: I arrived at 6.59 and was told it was not ready for my reservation at 7pm. I was seated by the wine cooler, where the staff kept hitting my table with the door. Very dissapointed. I saw there was bad reviews and good reviews, maybe there is good meals but in my case it was lower than average. Badly cooked, not fresh, salad leafs was brown, expensive in the end. Nice decor and good service though. But never going to come back. obviously New Years eve is not the best time for the Brasserie . The food was unexceptional, poorly cooked and expensive! My steak was overcooked and tough ,there was no sauce and the potato parmentier dry and hard. The amuse bouche was insignificant and the starter although tasty consisted of only 1 scallop. The desert was still frozen hard and overly copious and out of balance with the rest of the meal. Overall a rip off for 75 euros I'd never go again!